Here-to-fore, I had generally accepted the meme that where Wal-mart moves in to small towns, smaller stores tend to fail due to the competition. Unlike most who spread this meme, however, my response has generally been, "so?" The number of people shoveling coal into steam boilers has decreased with the rise of diesel locomotives. The number of people employed physically connecting phone calls with patch cords has fallen with the rise of automatic switching. Technology and distribution systems change and morph over time. But I have to admit I appear to have been wrong -- the meme itself may not be true. Via Mark Perry, who discusses this study in more depth. The graph, though, is inconclusive. There's nothing there to argue against the idea that some areas are just more prosperous (and therefore have both more Wal-Marts and more other businesses) while others are less well off. On the other hand there is something in Perry's post indicating that they did time series, so maybe this objection is addressed in the study. The problem with the supposition was that these small towns actually had businesses that provided the services that Wal-Mart did. Once you get out of the Northeast, particularly once you get west of the Mississippi, many small towns just aren't quaint little villages that can support overpriced local stores. Catalogue companies finished that almost 100 years ago (see: Sears). As an example, the small town I grew up in in Northwest Missouri. Many people would have to drive over an hour to St. Joe the nearest town over 20,000 people to get a lot of those goods and services until Wal-Mart came in, 17 miles away. Ironically, a very small and very regional competitor (Place's, now Pamida) opened a fairly sizable store on the square of my 2000 person town. Fifteen plus years later, both stores still exist (the Wal-Mart is exceptionally bigger now). If you want to see how the other meme get's spread, check out the story below ABOUT my home town. Needless to say the competitor to Wal-Mart is not mentioned. In the print edition, there was an "Empty Downtown" picture, which required the photographer to request people on a Saturday afternoon to move their cars off the street (so it would be empty) and was taken on the opposite side of the large courthouse, thus obscuring the competitor. There are also some exaggerations in the personal anecdotes in the story, that don't requiring going into, other than to stay the author got the story he was looking for. Everything I've observed indicates that a big retailer like Wal-mart is a net benefit to a small town. sure, some small stores may die in the face of the competition but the number of new businesses that spring up around the Wal-mart is much greater. These new businesses are specialists offering thing Wal-mart doesn't carry or premium goods beyond Wal-mart's range. With Wal-mart as an anchor for shoppers picking up their essential goods, especially if it is a Supercenter with full grocery section, the smaller businesses have far more traffic passing by to entice. I have to go with bbartlog, here. We know nothing about the nature of high-Wal*Mart density cities vs. low-Wal*Mart density ones. We also know nothing about the quality of the jobs of these small businesses or the benefits they offer compared businesses existing prior to the arrival of Wal*Mart. I would hesitate to draw any serious conclusions about this. In front of the Walmart nearest us is a Fantasy's gas-station/car-wash/convenience store. When ever I am there (usually to buy gas, sometimes to get my car washed, occasionally.....but wait a bit. There are a dozen or so parking slots in front of the C-Store, usually about 1/2 occupied. The people coming out of the store (including me on the in-frequent occasions that I go in) often have bottles of milk, bags of ice, large bags of snacks, boxes of beer, ...; all things that Walmart would cheerfully have sold them at a lower price, I am sure. Anecdotally speaking, this makes perfect sense to me. What do you typically see surrounding a given Walmart? Stripmalls. What type of stores typically set up in stripmalls? Ones that employ 5-9 people. And they do compete with Walmart, just a little bit up or down market. The trend over the last 20 years has been for lots of big box retailers to move into smaller markets. For example, when I went to college in Grand Forks, North Dakota, a small MSA of @100,000 people, there wasn't much for big box retail. They had the old Dayton's/Marshall Fields, Sears, Target, and JC Penneys. But while I was there and since then they've added Office Depot, Best Buy, Wal-Mart, Home Depot, Gordmans, a couple Starbucks, Barnes and Noble, a Super Target to replace the Target, etc. 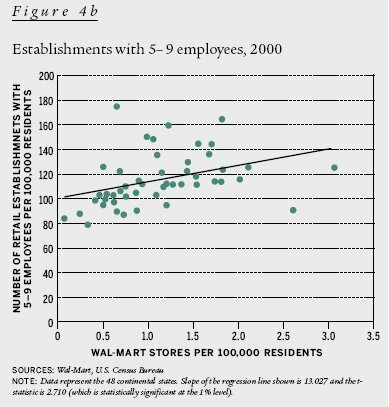 I don't have any data for this but my guess is that areas with more Wal-Mart stores per 100,000 people have likely added more of these sort of stores, too. How does Perry account for this, if at all? To add to that my grandma lives about 35 miles north of Grand Forks. It seems that during that time it's become more and more common for people in those smaller towns to not shop in town but do their shopping, even groceries, during a trip to Grand Forks. That is, how much of business are these small businesses in smaller towns losing to what seems to be a shift to regional shopping? 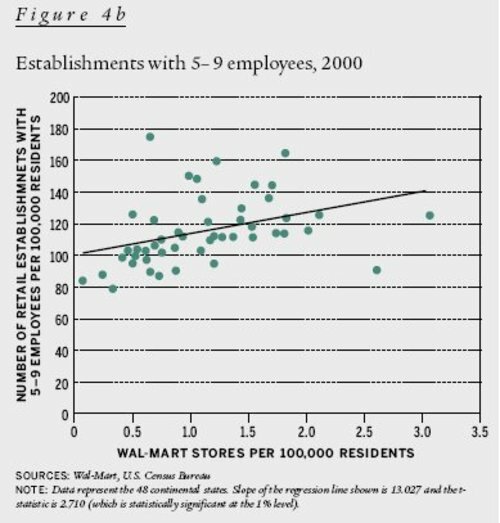 If Wal-Mart comes into a town and employs people who wouldn't otherwise be employed, they'll inject more cash into the local economy, driving up prices generally, which will incent entry into the marketplace. That entry may not be in the same vertical as Wal-Mart, it just depends on where local people decide to spend their cash. Definitely anecdotal, but it seems to make sense and jive with the chart.